Burnley boss Sean Dyche believes that Bournemouth may have benefited from Eddie Howe's tenure at Turf Moor. While the club's first game under Howe ended in a goal-less stalemate against Scunthorpe United at Glanford Park, it was the finishing fixture of his reign that typified his time in charge. The Clarets would leak 130 goals in 87 games under Howe as he bowed out following a 4-3 loss against Crystal Palace at Selhurst Park where the visitors surrendered a two-goal advantage. However, Howe operates a much tighter ship with the Cherries at the Vitality Stadium. Back at the club he made more than 250 appearances for as a player the former defender, who was voted Manager of the Decade at the Football League Awards last year, he started to turn things around. They culminated the 2012/13 term with six clean sheets in nine games as they were promoted to the Championship, conceded less than a goal a game on average as they climbed to the Premier League as champions and they've appeared less expansive this term, despite the seven-goal thriller against Liverpool last weekend suggesting otherwise. 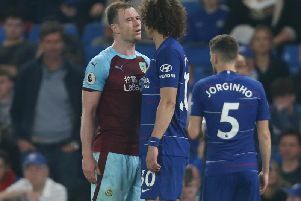 "I don’t know whether it’s from that experience but when he went down to Bournemouth and got them to go up in the season they did from the Championship there was a definite difference in the way the team was operating," Dyche claimed. "A couple of years ago before they got promoted I think he changed things. It was very open from both sides of the game, defending and attacking. "Now they don’t stay open. I watched some of their games they were tighter out of possession. Whether he’s been influenced by thoughts from other or his staff or players, I don’t know, but I think that’s been an important change. "I’ve noticed it and my staff and some of my players have mentioned it. They know, so I imagine most people do know. It works, you’ve got to twist and turn things until you get to where you think it can be quite productive." Dyche added: “The team I took over here was expansive out of possession and in possession, that's changed. He'd obviously done some work with his team to allow that to happen. "I thought against Liverpool you saw them get the ball forward, they got a goal from a long throw from. We've all got to move forward, challenge our group to get results no matter how they come. He's done a very good job of that let alone the bigger picture he's done with the whole club." While Eddie Howe makes a second appearance at Turf Moor since his departure four years ago, the fixture will also see Junior Stanislas make his return. The 27-year-old, who made just short of 100 outings for the Clarets, has been in fine form for tomorrow's opponents, netting three times in nine games in the top flight. "The reason I’m really pleased for him is that it seems like he’s stuck at it," said Dyche. "When he first went down there he didn’t play a lot, then he’s come through and done really well this season. "I like players who stick at it, I don’t think a football career is an easy career, to keep sticking at it and pushing yourself, through whatever comes your way, I think he’s done very well with that." He added: "It was hard for him coming all the way up here and settling. He had twins, to live away with that scenario is difficult. "Going back south helped him I think but he was good for me, I enjoyed having him around and I enjoyed what he tried to do for us. We wish him well beyond playing against us, if he plays of course."